Whether you're trying to cover up grey, highlight your locks, or go blonde bombshell, lots of us dye our hair either at home or at the salon. We've reviewed hair dyes, tips to keep dye off our skin, and products to get dye out when you forgot to lube up. But what to do to keep you hair healthy after you dye? L'Oreal Feria Color Moisturizing Treatment, that's what. Earlier this year I got the idea to lighten my own hair. I regularly dye my own hair, so I thought nothing of trying to take my long dark brown hair to a light golden brown. What I ended up with was orange brown hair with light orange roots. Even my normally oblivious guy friend took one look at me and asked "What did you do to your head?" In my attempt to fix it I stripped the color, then dyed over it. In less than 2 weeks I had bleach/dyed my hair, then stripped, the demi-dyed it twice. My poor hair was trashed and it felt like straw even when it was wet. 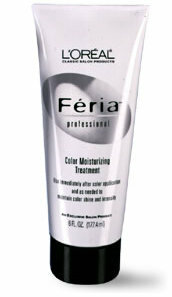 Enter L'Oreal Feria Color Moisturizing Treatment. Some of you may be familiar with this treatment as the little tube of after-color conditioner that comes with your box of Feria. Lucky for all of us, you can buy 6 oz of this stuff by itself at Sally Beauty Supply or Amazon. The treatment has the consistency of regular conditioner and a pleasant flowery smell. You slather this on your head after shampooing, leave it in 2-5 minutes and rinse. Instantly you hair will be smoother, shinier and softer. I used this treatment in my hair twice a week alternating with my regular conditioner and my hair was back to it's regular self within a month. Even when my hair isn't as fried as Lindsey Lohan, I still keep this on hand to give my tresses a little love and a lot of shine. Overall, for about $8, this treatment leaves your hair silky, shiny and doesn't feel heavy or greasy. You can buy the conditioners separately? Sweet! Thanks Vee! I know Mel, it's the best part of the Feria box! Plus, at my ghetto Target people steal the conditioner out of the box if you aren't careful. We're loving our sisters over at Persephone Magazine! Click here to visit Ask a Manager. © Hot Ink 2011 | All Rights Reserved. Powered by Blogger.